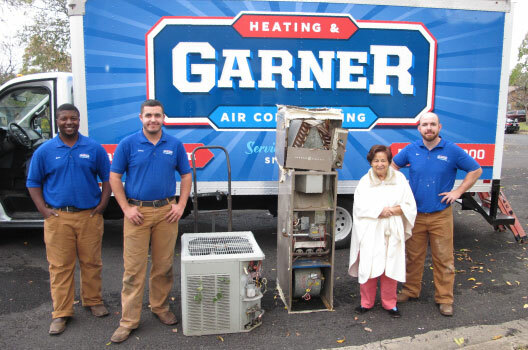 With Garner – It’s Guaranteed! Look no further to get repairs, replacements or maintenance for max efficiency all throughout the warm season for years to come. Stay warm and eliminate breakdown stress with repairs, replacements or maintenance that guarantee dependability. Garner was selected to be a Diamond Contractor by Mitsubishi Electric in order to provide you with high quality ductless mini split options. Attic Insulation is an easy and extremely long-lasting solution to efficiently regulate indoor temperatures. Well installed and maintained ducts are crucial for an efficient HVAC system, and we can provide that for you. Has your unit been updated in accordance to the Environmental Protection Agency Requirements? Call or schedule today to learn more! Receive email reminders for The Gift of Heat nominations and recipients. The Gift of Heat program allows us to help the people who need it the most through your nominations. We look forward to another year! We have decided to hire you to install our new A/C system and we would like to go with the “Good” model that you quoted us. Our decision was reached based on the many positive reviews of your company that we read, the quality of your work, and the fact that you are including raising our pad and realigning some of our duct work and cleaning and sealing the return chase to make a more efficient system. None of the other companies offered to do that extra work (or even mentioned that it was an issue).